I’ve been on a fitness drive for a couple of weeks – mostly involving riding the exercise bike while playing Fifa on my xbox. I covered 103km the first week and 70km the second. The dip in distance in the second week was due to starting some other workouts found on YouTube. It was then that I remembered about the Insanity Workout and decided to look into it a little further. I’ve never been one to just exercise. I play football once a week for an hour and do a little cardio on the static bike as mentioned above. I did play ice hockey from the age of 10 until I was 24 when I had to give up. I pretty much did no meaningful exercise for 2 years, before starting to play football. Anyway, I decided to give the Insanity Workout fit test a try yesterday. 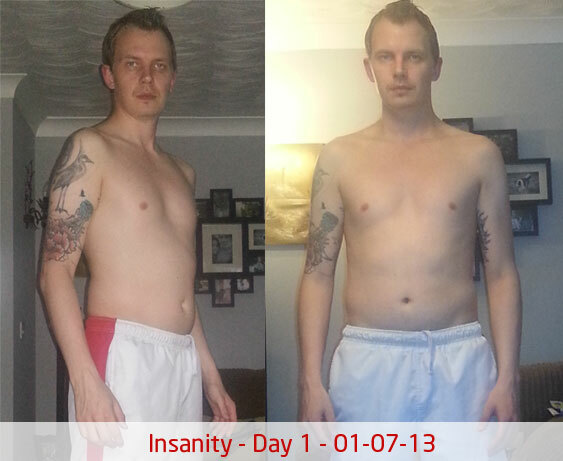 The Fit Test is day 1 of the Insanity Workout and comprises of a series of 8 exercises. You do as many reps in a minute as you can for each exercise, with a minute or so break in between each exercise. Giving a total of 271 reps.
After doing this, and quite enjoying it in some strange way, I decided I’d commit to Insanity. So, with it being the first of the month today – I decided to make today day 1 and to start from scratch. For day one, read more. I’m going to post weekly / bi-weekly progress pics to keep track of any changes, no mater how slight. Here’s the starting point. This entry was posted in Exercise, Fitness, Insanity Workout and tagged exercise, fitness, Insanity, Insanity Workout, Workout on July 1, 2013 by Stephen Hoult.